These senior cat care tips will help keep your older kitty less stressed and in better shape. 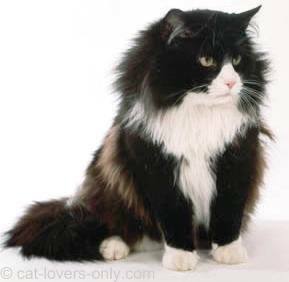 Cats are, by and large, very sturdy animals, and many are living to more than 20 years of age. This, however, brings health, behavior, and care issues that need to be addressed. We've covered some of the top senior cat health problems here. We also have general tips for cat owners here. Now we'll cover a few cat care tips for older felines. Despite their naturally hardy nature, cats do become ill, have behavior problems, and sometimes become injured. This is increasingly likely as they age, and there are some age specific conditions that are more prevalent in older cats. They also have a knack for hiding pain and discomfort, making it difficult to tell when they are ill. This means that many conditions may go undiagnosed. It's a routine thing -- Make sure you know your older cat's routine. If you notice any change in behavior, or any of the symptoms listed here, consult with your veterinarian. Make it easy -- Make things easy on your cat. Provide easy access to litter boxes, food, toys, and other areas. Provide warm beds out of drafts for sleeping, and easily accessible comfort areas. Provide cat stairs or a ramp for your cat to get on the bed or other areas. Toys are good -- Although somewhat less active, senior cats still need stimulating playtime. Provide stimulation in the form of interesting cat toys and lots of interactive time as well. I can't reach that spot -- Help your cat groom.As cats get older they may need help grooming themselves, especially those hard to reach spots. Groom your senior cat regularly to reduce hair balls and promote healthy skin. Order yourself a FURminator deShedding Tool to make the job easier. Check me out -- Perform weekly health check ups. Use grooming sessions and play time as an excuse to check for senior cat health problems. It's more important than ever at this time in your cat's life to check for mobility problems, pain, clear eyes, and other signs of health (or disease). Give a kitty massage -- Treat your cat to an acupressure session. There are small animal and cat massage therapists, some of whom are trained in acupressure. You can learn to do this yourself as well. Acu-Cat: A Guide to Feline Acupressure can teach you. Acupressure is like acupuncture but instead of using needles, you gently massage the pressure points. Many cats have been reported to enjoy these sessions and proponents of acupressure say it relieves stress. If nothing else, most cats like a massage and enjoy physical attention from their owners. Giving physical attention to your cat can also lower your blood pressure and improve your bond with your cat. Don't bug me -- Know when your cat has had enough. Give your cat the space she needs, especially if she gets grouchy or seems agitated by too much attention or over stimulation. In addition, it's been reported that many cats don't see the vet nearly as often as they should. In fact, according to the American Veterinary Medical Association (AVMA), cats were twice as likely as dogs to not see a vet in 2006. Last I heard, AVMA now recommends that you take your cat to the vet twice a year!